OXFORD, Miss. 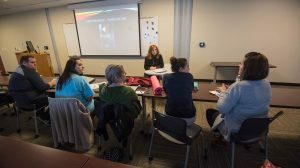 – The inaugural session of the Living Music Institute, which ran Jan. 18-21 at the University of Mississippi, got high marks from students and music professionals alike. The Living Music Institute, a production of the Living Music Resource in the UM Department of Music, is an intensive workshop for opera aria singers. During the workshop, students received personal attention from faculty members and special guest and opera star Kallen Esperian. Student participants also attended master classes, coaching sessions, yoga classes aimed at performers, acting classes and aria performance classes. The workshop concluded Jan. 21 with a student competition in David H. Nutt Auditorium. Rebecka McAlister, a graduate student in music from Jonesboro, Arkansas, won the event, which included a monetary prize. She also will perform with the LOU Symphony Orchestra at 7:30 p.m. Feb. 19 in the Gertrude C. Ford Center for the Performing Arts. Tickets are $10, available through the Ole Miss Box Office at the Ford Center, phone 662-915-7411. Led by Nancy Maria Balach, an associate professor of music, the Living Music Resource started as an online library of videos produced in-house from interviews with musicians and vocalists. Students from 12 states applied to be the inaugural Living Music Institute participants. Sixteen singers, representing nine states, were picked for the cohort. The participants all were talented and unique, Esperian said. 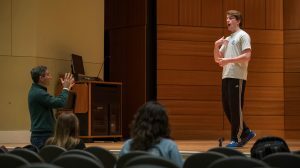 The opera star also said she found the students very open to the feedback and advice given to them, and said she hopes they capitalized on the opportunity to learn from professional artists. The Living Music Resource’s expansion to offer the Living Music Institute is a natural result of the program’s growth and the educational and artistic collaboration between Balach and Amanda Johnston, Living Music Institute co-director and associate professor of music. The idea for the institute first occurred when Balach and Johnston established the Living Music Resource’s “Next Step Audition” day, which occurred in 2016 and 2017. They recognized that this opportunity “filled a void” in the region for emerging artists, but wanted to expand it. They began creating the framework for Living Music Institute in spring 2017 and launched it last month. The interest in attending Ole Miss for graduate education dramatically increased by the end of the weekend for many participants, she said. “The UM music department is now offering a program unique to our region that has national reach,” Balach said.